Hotel Galant is located only a few steps away from the Mikulov historic centre. The hotel offers first-class regional and international cuisine and the best wines of Moravia or the beer from the mini-brewery Galant. You will be accommodated in cosy, newly furnished rooms – each with interactive PC / TV and internet connection. After scientific sessions you can enjoy a rooftop swimming pool, whirlpool bath tubs, sauna and numerous procedures in spa centre. 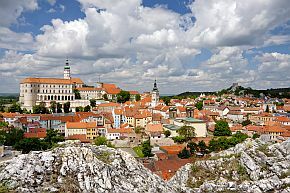 Mikulov is a picturesque historical town located in southern Moravia in the very heart of a wine region. The first written record of the town dates back to 1173. The priest, cardinal and Bishop of Olomouc Franz von Dietrichstein took over the estate in 1611 to create a residence worthy of his position in the state. He was responsible for the transformation of Mikulov from a small provincial town into the most important town in Moravia at that time. The town offers perception with literally all senses. For many people the reasons for a visit include history embodied in architectural monuments, while for nature-lovers and people preferring active rest it is the unique natural conditions of the region. To those who appreciate good wine, Mikulov offers rich viticulture tradition. The geographical position, the climate and the varied soil of the Mikulov wine region with the limestone slopes of the Pálava Hills affect the unique character of the local wine. This was already discovered by Ancient Romans, who considered the Pálava region ideal for vine growing. Nowadays Mikulov and its surroundings offer a lot of vine paths with stops at local public or family wine cellars or wine tasting centres. Local vintners regularly win awards at prestigious international competitions. Mikulov can be easily reached from the international airports in Vienna, Brno, Bratislava or Prague. From Brno there is a direct bus connection to Mikulov. The hotel page provides an excellent navigation from Brno, Vienna and Bratislava. In case you are interested, contact please sales@galant.cz well in advance and provide the service with detailed information on your flight. The SCCG 2017 organisers recommend arranging for accommodation in the Galant Hotel directly. The hotel offers an extra rate for the SCCG participants, which is CZK 1500 (cca EUR 55) per single room per night or CZK 1900 (cca EUR 70) per double room per night. To make the reservation of accommodation it is necessary to send an e-mail to hotel@galant.cz and as a subject of the e-mail “SCCG 2017” must be mentioned. DO NOT USE the hotel’s online reservation system otherwise a full rate will be charged. The discounted rate will be guaranteed to those who will book their accommodation by May 10 at the latest. Further accommodation options are available here. Free access to sauna and whirlpool (daily from 8:00 to 12:00) is included in the cost of the accommodation. In case you are interested, it is possible to book a massage – the offer with the price list is available here. It is recommended to book the massage in advance via e-mail spa@galant.cz or by phone: +420 723 685 137.